The train hopping was easier than expected - and at times much harder too. Alone here - just as I had started in Winnipeg June 4th of this year. But I don't feel lonely because I've met many interesting people. Actually, this place is so new I'm the only one here. Even the owners are elsewhere tonight. The comfort of this brand new hostel, The Black Rooster Roadhouse, is a sharp contrast to some of the experiences of the adventure I experienced. If you come to Prince Rupert I recommend the place, a fully renovated former two story apartment block. Nice owners, Bozena and Stan Sliwa, formerly from Poland, they have a small restaurant and the food is great. It's only $20.00 per night. Colour TV and kitchen facilities and showers with lots of hot water. Luxury. But after several days of cold beer, soft pillows, color TV, and boring yuppies who travel by ferry and cruise ship I'm itching for the rails again. CN is busy here - a brand new container port is in the works (a billion dollar venture). Just east of town is the gigantic grain facility where grain trains are emptied for shipment of their cargo to Asia and elsewhere. VIA rail runs a brisk business all summer bringing in loads of yuppies and their yapping poodles. It sure is a nice little city though. Grand Trunk Railroad founded the city as its westernmost terminal over a hundred years ago. It's populated by friendly Vietnamese, Chinese, Native Indians, and whites. Haida and Tsimshian Indians have called this paradise home for centuries. Although it's often wet, it is often just drizzle - a wet misty rain. Interestingly, Prince Rupert is known as one of the rainiest places in Canada - but not now. Actually the weather has been great here. Sometimes the sky descends to meet the earth with a supernatural mist that hovers in small blotches then they vanish like ghosts of the past in search of a permanent home. When it's sunny it's a paradise. Just about anywhere you go you can see beautiful panoramas. Rupert is built on the sides of hillsides similar to St John's Newfoundland. Beautiful multi coloured perennials are everywhere and you can look up and see bald eagles soaring high above the city. Canada Day here saw Vietnamese, Filipinos, and others serving out their ethnic foods downtown in front of a spectacular view of the Pacific Ocean. Local folk musicians played and I took pictures of kids climbing the tall statue of a pioneer who holds a ship's wheel while pointing to the horizon. Canada! I had felt like I was home. But when I hear the whistle blow at night south east of town I feel a yearning for a different kind of home - one that runs on rails. It's a warm feeling - like you get when you take a good long gulp of Southern Comfort. It's a friendly feeling, one I've become familiar with now. 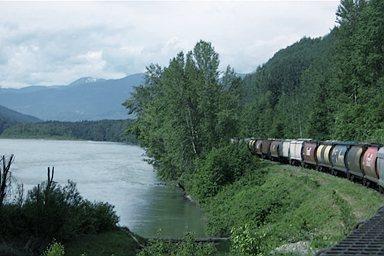 My next trip will be down the Fraser River by BC Rail (now owned by CN) to Vancouver, a city I won't be staying long in. Grew up there. Bad childhood memories. I mistakenly named a recent article 'Hopping the Fraser Canyon' - even though it was a hop from Jasper to Van - a route that actually follows the Thompson River but does run along the Fraser south of Hope BC. The only reason to go there is to search for the wanderers. I am merely an interloper into a world that belongs to others. During my four month journey I hope to interview the wanderers where I find them. That is my real aim. Whether to publish it in book for or otherwise I don't know. I am always very happy when I run into them. Wherever I am in Canada my eye is always searching for young people with dark clothing and dirty fingernails. I met Speedy in Winnipeg just before I departed. She is heading east to experience life on the east coast for a change and wants to travel for a year before settling down again. Some of them head east for the summer and west for winter where the climate in Canada is milder in winter. Pirate is different. I met him in Winnipeg in May too. He prefers to head west in summer although he lives in Ontario in the winter. A damned good banjo player he makes a good wage on the streets of our cities. Ryan, from Winnipeg was heading east I gave him my tent since I have bought a bivy sack which was quite useful against the rain of Saskatchewan. John, another good banjo player, I think was heading east - another guy with years of experience and stories to tell. Unfortunately, I left the notes I made interviewing these folks in Winnipeg in May so I don't have all the names with me now. They are all very interesting individuals who stick together when they meet and are part of Canada's most interesting culture. They are a part of the history and culture of our nation - an interesting and real part of it just as the hobos were. Many of them busk on the street or panhandle, and many others obtain work from temporary labour agencies and then move on again. To them this is a lifestyle and they are experienced and well travelled. I have agonized over writing anything at all about train hopping since bringing attention to it is not serving them with any special help. But the authorities know about train hoppers anyway. The young people who frequent the cars of our Canadian train companies are experienced and very unlikely to get injured. I really believe that. To them it is part of their lives and they should be allowed to continue without intervention. There are others, however, who are merely rich thrill seekers and can afford to take other modes of transport or take VIA. They should. These are people who have four hundred dollar tents, and scanners to listen to the train company chatter. As in the past, they have not accepted responsibility for their actions and probably wouldn't now as they travel the world in search of the next thrill. They'd probably bring a law suit or something if injured. Some people think they can barge into anywhere they want and have the world offered to them on a platter. Some do it as a sort of hobby because they really do love it; I think that's o.k., if they're willing to take the risks. There is a very small subculture in Canada and the young men and women in this subculture are earthy, experienced, and tough as nails. 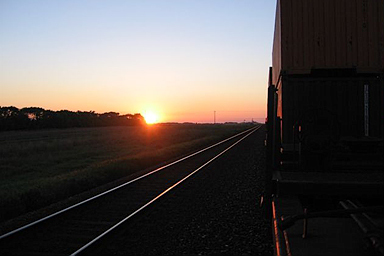 The number of train hoppers in Canada are far less than in the United States where thousands hop trains. I think the numbers here are only in the dozens possibly. The average age here is younger too I suspect. But most of these regular hoppers are very experienced and many have hopped across our great nation several times. Although some may hold some views of another subculture in the 60s, the hippies, I don't think they are similar. The wanderers are more interesting. 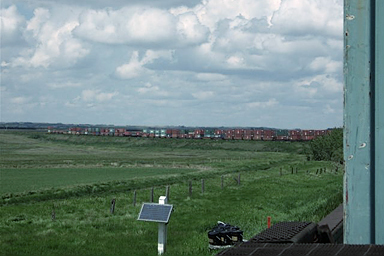 The route I followed (by train) is known as the Yellowhead. The highway follows the same general direction as the train route. A Métis scout whose nickname was Yellowhead because of his blonde hair had the route named after him. The Yellowhead Highway starts in Winnipeg in Canada's eastern prairies and ends in Prince Rupert BC on the northwest coast. Winnipeg Manitoba. Canada. June 4th, 2005. It's drizzling and threatening to shower again. I arrived at the Fort Rouge yard after midnight and nothing to catch westbound. The only thing that happened was that a small group of young morons came running through the yard throwing rocks at the train that headed west earlier. I didn't come out of the bush then or I probably could have caught it - an intermodal. They were actually trying to lob rocks into the ends of the 48s for some reason. Perhaps they knew people might be there? It always amazes me how cowardly and vicious people are when they face someone who can't fight back. I had be pleased, however, to see how some of the wanderers handled obnoxious well-offs who almost always stumbled out of nightclubs and tried to harass them each night. What they often got was something different than a meek submission which most homeless people and panhandlers on the street respond with. The wanderers often kick their ignorant buts - much to the surprise of the drunken rich pricks. And they said there was no justice in the world! One more reason to admire those rascals! If for nothing else, I admire them for that. I tired of waiting and slept in the bushes and next day watched and waited. I know a few people have been fined in this yard so you have to be very careful. I finally caught out around 5 A.M. - almost 28 hours after I had begun waiting there. Probably could have caught out earlier than that but was overcautious I guess. It began raining as I hopped aboard. But after a few hours the rain stopped and I began taking pictures with my digital camera. The sun came out and I took off my socks and boots and they dried by the time we reached Saskatoon Saskatchewan around 6:30 P.M. I don't remember going through Melville - I was sleeping at the crew change. Winnipeg to Saskatoon had started out bad but ended good. It was a long hike into town. The CN yard is south west of town a ways. Hadn't remembered to bring enough food so I bought a loaf of bread and bologna used more than half the loaf and slices of bologna. When I walked into the store there was a cop interviewing the clerk about a theft but when he saw me and my back pack and dirty appearance it looked like he was more interested in interrogating me but he didn't. The cops have a bad reputation in Saskatoon. The Broadway area is the funky area of town where artists live and college students frequent the local night spots. It is the best spot to panhandle in Saskatoon. I slept under a wheelchair ramp of an Anglican church - the surrounding bushes hid me nicely. Saskatoon isn't a crew change but most trains seem to stop there anyway. It's a nice little city of about 200,000 people. Saskatoon is a very green city with lots of trees. Although it's a city with a bad reputation for injustice (i.e. David Milgaard) and the police 'midnight rides' (they drove Native Indians at night to the edge of town in winter where a couple of them froze to death). But the average person there is o.k. and it's a city worth visiting. I took the bus up to Prince Albert and my aunt and cousin picked me up. I spent a few days visiting my dad and stepmother as well as my brother. I stayed in a hotel one night across from the CP yard and noticed three engines in their yard but no cars at all. My brother told me that the engines just come up to Nipawn and then turn around and go south again I suppose working along the way and building grainers. I caught out from Saskatoon a few days later. I only waited for four hours and caught a nice 48 again. Had a can of beans and can of fruit on my 48. It's amazing how good a can of beans can be when you're hungry - with freedom and the view of the magnificent prairies on top it's a dinner that cannot be bought for a million bucks. I arrived in Edmonton at around 3 P.M. the next day. I took a lot of pictures. It's beautiful scenery (if you like the prairies) between Saskatoon and Edmonton. It took about 12 hours I guess. It was in Edmonton that things took a turn for the worst - or the humorous, depending on your viewpoint. I spent a couple of days in Edmonton and then attempted to hop out to the west but it didn't go exactly the way I planned. After spending a couple of days in Edmonton I attempted to catch out to the beautiful Jasper resort town which is situated in the mountains near the British Columbia border to the west. But I made a common error - I became impatient and got tired of waiting in the bushes. I waited for about seven hours only but nothing was heading west and they were building trains on the south side of the Calder yard where I was so attempting to catch anything there anyway seemed unlikely. But in the early morning I saw a nice train with 48s I had missed. I didn't know exactly which direction it was going but I thought in my impatience that if it was going east I didn't care. It was much easier to catch out in Saskatoon anyway and I could get some sleep. That's exactly what happened. About 12 hours later I was back in Saskatoon. Had a sound sleep too. You sure feel secure in a moving train - nobody can harm you and you just feel like you're King of your own little balcony. I bought too much food at the grocery store that is much too far away and lugged it back to my spot south of the yard. I only waited a few short hours when a west bound ground to a halt and I got it. One problem, however, was an old couple who had seen me make my way across the large field south of the train yard. I had walked to a grocery store about a mile north of the train yard. They had driven by on the road and seen me crossing the field with my back pack and stopped and hidden in the bushes to the west. When I passed them they were pretending to be sitting on lawn chairs doing nothing. But when I went passed them on the road they got in their old pick up and pulled out partly onto the road and commenced watching me. I was so pissed off I walked up to them to ask what the hell they were spying on me for but they jumped into their pick up and took off but stopped a few hundred yards down the road. It never ceases to amaze me how snoopy and petty people are if you are any little way different - or poor. After hopping on the train I didn't wait long for I was not watching, however, when the train departed westbound and didn't notice it take a slow turn to the left and thus southwards. 'Damn!' I thought another mistake. But going to Regina or Calgary didn't seem too big a problem though so I relaxed and enjoyed the scenery. My only worry was the rain falling in southern Alberta I had heard about in the news - and flooding. Calgary is one of Canada's wealthiest cities and holds the Calgary stampede each year, a big event with people visiting from around the world. Unfortunately I couldn't stick around for the festivities because I wanted to reach the west coast so I would be able to go from coast to coast in my adventure. But I was to make another humorous blunder and spend two days in the rain for nothing. I found the CP yard no problem and noticed a lot of grainers in the huge yard just southeast of downtown. But I waited all day for nothing again. It was raining alot, on and off, too. I had actually wanted to go past southern Alberta because of the record breaking rainfall dousing the southern region. The second day I waited patiently again having learned my lesson in Edmonton - '...Be patient, something will depart eventually. Just be patient.' But after 48 hours in the cold and rain I realized something was wrong so I approached a crew member and after startling him inadvertently got the news - '...nothing is moving west or north, the tracks are out because of rain..' I felt like a complete fool - I had spent the night previously in an old abandoned car with no rear windshield and it had been cold and raining like hell. I could have avoided all that discomfort and wasted time. So I got a Greyhound to Banff, just a couple of hours west nestled in the Rocky Mountains. It was frustrating there too since a few intermodals did stop but nothing ridable at all. It's the old story with CP - few ridable cars and apparently no grainer even. But the stopover was not uneventful, however. 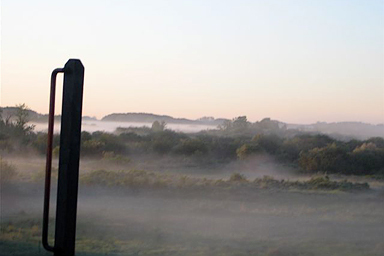 The RCMP, Canada's rural police force questioned me as I slept in the bush. I had been a little perturbed because the officer did a careful questioning of me. "There is no rash of crime here is there ?, " I had complained. But he turned out to be a nice young fellow from Saskatchewan where I was born. He told me that there was a peeping tom in the neighbourhood. "I saw somebody last night," I told him. He asked me his description and when I told him it fit the guy they were looking for to a T. I had seen him 'creeping' around at 5 A.M. and he had passed me jut 20 feet away but had not seen me since I was covered in my 5' x 12' camoflage blanket. Hey! my contribution to society! The next night in Banff I decided to sleep in the bush near the highway and keep away from cops and peeping toms. I don't like being a rat but I don't like peeping toms and pervs either. I awoke again at around 5 A.M. and was rearranging my bedding when a train whistle blew. I heard barking and yelping all around me. I turned my maglight on and shone it in a 360 degree circle - all around me I saw yellow eyes gleaming at me. 'To hell with it!' I thought, ' Too damned tired, they can eat me if they want.' I soon fell back to sleep. I don't know if they were wolves or coyotes but they must have thought I was too big to eat since they didn't gobble me up. I managed a few pictures on my way to Prince George.. The scenery is nice towards Prince George and I had a big bottle of Colt 45 to enjoy. Great beer. Who said the Americans can't do anything right? Arrived into Prince George about 10:30 A.M. the next day. Upon arriving in Prince George I waited in the boxcar because I thought it would continue west. It didn't, shortly after arrival they started working on it and after several violent kabangs I fell asleep and had a nap. I must have been tired because the banging didn't bother me too much at all. I was glad I had remembered some wise advice - never rest your head against the far walls - you could get a big headache! Around 8 P.M. I ventured off the train and west of the yard. It was a nice partly cloudy day and I enjoyed a couple of cups of coffee from the Mohawk gas station just south of the yard. I caught out on a westbound grainer around 12:30 A.M. and arrived in beautiful Prince Rupert B.C. on the coast earlier than I had expected, around 1:30 P.M. Upon arriving in Prince Rupert (or just east I should say) at the grain facility I was amazed at how big it was. Had some trouble trying to avoid workers and first headed east to what I thought was the highway but turned northwest and through some of the thickest thorny jungle I'd ever seen. Finally made it to the Ridley Island access road just north west of the facility and hitched a ride into town with a guy who worked at the grain facility. I told him I had been camping and bird watching. He told me the grain facility was operating at only 30% capacity but CN is building a brand new container port costing a billion dollars. In Prince Rupert it was sprinkling rain. I ditched my pack in a 45 gallon garbage container and proceeded into town. A nice employee of the busy bingo hall on 2nd Ave told me about the Black Rooster Roadhouse so I got my pack and went there. What I find the most exiting is actually waiting for the train when you know it's coming, seeing the headlights and then as the engines pass with their deep throaty rumble, your adrenalin surges and you make your move. What an experience! Every time I head down the rails I admire the wanderers and train hoppers of North America more - it takes a lot of patience, courage, and endurance. But what I admire about them the most is the freedom they have found - the hardships and discomfort are well worth the sheer individual freedom you find. There's nothing like it. But the journey's not over. I am headed east in search of the wanderers in their summer stomping grounds.